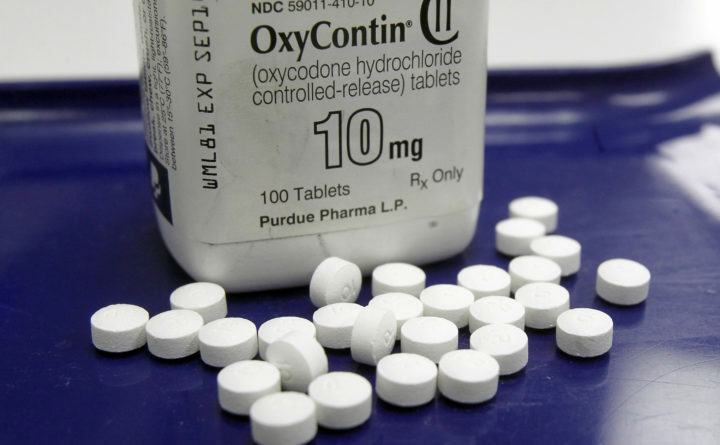 This Feb. 19, 2013, file photo shows OxyContin pills arranged for a photo at a pharmacy in Montpelier, Vt. A Hancock County physician lost his Maine medical license this week after he was arrested in Maryland for allegedly issuing more than 516 painkiller prescriptions ― for at least 38,600 pills ― to a fictional patient. A Hancock County physician lost his Maine medical license this week after he was arrested in Maryland for allegedly issuing more than 516 painkiller prescriptions ― for at least 38,600 pills ― to a fictional patient. The Maine Board of Licensure in Medicine announced Friday that it had ordered a 30-day license suspension on Tuesday for Dr. Brandt Rice, a family medicine specialist and Blue Hill resident whom the board identified as practicing in Brooklin. Further disciplinary hearings are likely but no date has been announced. The board’s action follows Rice’s arrest by police in Montgomery County, Maryland, in April. According to Maryland media accounts, he was charged with four counts each of unlawfully obtaining prescription drugs by forging a prescription and possessing a controlled dangerous substance. The board’s own month-long investigation found indications of five violations of Maine medical license standards, including fraudulent conduct, prescribing drugs for non-therapeutic purposes, and failure to cooperate with a board investigation, according to the board’s five-page suspension order. “The board finds that the information regarding Dr. Rice constitutes immediate jeopardy to the health and safety of persons who receive medical care from Dr. Rice and that delaying imposition of a suspension until holding a hearing would fail to adequately respond to this known risk,” according to the suspension order. Maryland police arrested Rice on the eight charges after videotape surveillance at four pharmacies in Potomac and Bethesda allegedly showed him placing and collecting four oxycodone prescriptions between Dec. 14 and Dec. 23, 2017, according to Maryland media accounts. The prescriptions were for a 66-year-old patient identified as Aaron Rice, whom Brandt Rice allegedly claimed was a prostate cancer patient who had recently moved from Maine to Maryland. But Maryland police said that searches of state and national databases failed to find Aaron Rice, and mailing addresses the doctor allegedly listed for his patient in Brooklin and Bethesda were bogus, according to media accounts. Maryland police allege that Brandt Rice obtained 316 prescriptions for Aaron Rice from January 2011 and to December 2017, mostly for oxycodone and hydrocodone. In all of 2017, Brandt Rice allegedly collected 11,600 tablets of oxycodone for Aaron Rice and paid for them himself. The arrests were the culmination of a four-month investigation, according to media accounts. The Maine license board didn’t hear of the April arrest until two of Rice’s patients reported to board investigators that the doctor had been liberally prescribing opiates, according to the board’s suspension order. One patient, a woman, told a board investigator that this led to her becoming addicted to the medicine. The reports came on May 8 and May 11. Board staff left several messages with Rice on May 14 that he never returned, according to the order. Board investigators found records in the Maine Prescription Monitoring Program indicating that Brandt Rice had placed prescriptions for Aaron Rice at Maine pharmacies for more than 200 prescriptions, or over 27,000 pills, from June 2014 to December 2017, for oxycodone and other painkillers, according to the order. At least one of two addresses, in Brooksville and Brooklin, listed for Aaron Rice matched those for Brandt Rice, according to the order. Board investigators also failed to find Rice in national databases, and pharmacists in Blue Hill confirmed delivering prescriptions for oxycodone and hydrocodone to him, with Rice again collecting and paying for the drugs himself, according to the order. Web searches indicate that Rice had a practice in Blue Hill for several years. Rice also never responded to a board subpoena for medical records, according to the order. Another board hearing will be held. No date has been set. The board also banned a Caribou physician, Dr. William Ortiz, from practicing in Maine. The revocation of Ortiz’s license is part of a consent agreement made this week that resolved a complaint against him. The complaint was based on Ortiz’s failure to disclose information on his 2017 renewal applications. During the investigation, Ortiz “underwent an evaluation which identified diagnoses that may result in his performing service in a manner that endangers the health and safety of patients,” according to a board statement. The board is a state agency charged to protect the health and welfare of the public by verifying the qualifications of physicians and disciplining physicians for unprofessional conduct and incompetence.